At the most basic level, games at Rezzed arrive in one of three states. Some are complete, either newly released or only a few days away from being so, the show floor being good advertising with the thousands of eyes passing through. Most are work in progress, usually with a few months still to go before being finished but in a state where we can easily get a feel for the game it’s going to be. And a very few are more concept than anything else, getting early impressions and feedback from people willing to try something that isn’t yet in a state to be called a working game. King Under the Mountain fits comfortably into that final category, with members of its team seeking opinions from the public in the indie room. It’s undoubtedly no coincidence that the game on display at the show coincided with the launch of a Kickstarter campaign to fund further development, and the demo on show at Rezzed is also available as a proof-of-concept demo from the fundraising page. What is proposed is a high-level settlement management game in an equally high fantasy setting, as your settlers carve out a niche – often literally – in randomly generated wilderness environments. It’s high-level, as you are not intended to oversee every single thing your teams produce. You will be telling them where to tunnel for space or resources, which trees to fell, which foliage to clear, but you won’t be overseeing every ingot made or tool crafted. Instead, the demo made clear that you’re setting up infrastructure, which specialists take over as needed. Mark out rock to mine, and miners will get to work; find lumps of useful stone and someone will automatically take to a workbench, carving it into building blocks. Of course, the clearing of space and gaining resources is pretty much all that the playable demo currently shows. There are a few items to order made, but very few, and the shape of the game in the longer term had to be filled in by team members on the show floor, and by looking at the Kickstarter proposal. While the title “King Under the Mountain” strongly infers dwarves, the game is also planned to have humans and orcs as playable, with different characteristics to account for, and likely different interactions with other creatures encountered in the world (something else that wasn’t in the demo, which was largely a sandbox with no other creatures beyond my large team of dwarven labourers). And while my untiring teams gathered me several types of stone and wood, how these materials will effect things made from them sounds like it is still being planned. 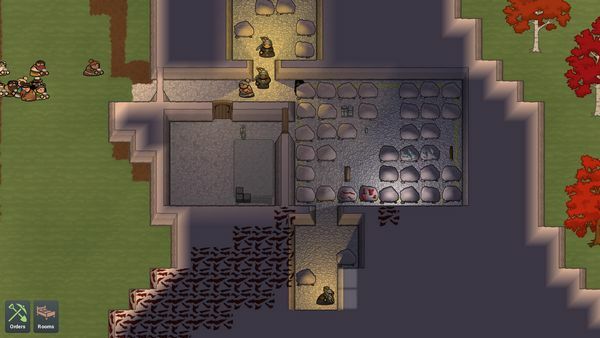 Both Settlers and Dwarf Fortress are cited as games the team have drawn inspiration from, and while watching workers run through stages of production definitely carries a vibe from the Settlers series, the game at large feels like it wants to draw on the way stories develop in Dwarf Fortress. This is a large part of the appeal of games like this, as events happen and it becomes part of the lore in how your settlement succeeded (or failed). Simply put, having something that creates a sense of narrative can be important – a hook to keep motivation for your settlement’s progress. 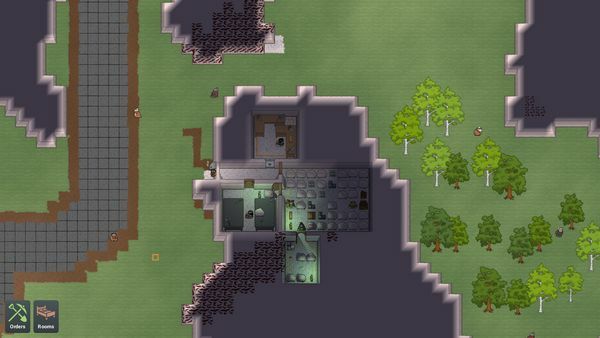 A large part of the satisfaction in playing even the demo here was tunnelling rooms and corridors into rock, visualising how they fitted with the accepted lore of fantasy dwarves, and seeing it as the start of something that – from its current technical point of view – cannot be finished. Some of the stretch goals also seem to recognise how stories flesh out a game beyond the core mechanics, with one inspired by the nemesis system from Shadow of Mordor in giving you consistent – but randomly created – recurring enemies… which also sparks the imagination, as well as establishing the idea of a world existing beyond your immediate vicinity. It’s hard to say what sort of game King Under the Mountain might end up being, beyond how the current state is a solid start towards an accessible game placing you in the role of overseer. Certainly, the development team have taken solid steps on showing they can make a game by getting a demo available early; whether they can make a game as ambitious as some of their goals suggest will obviously be proven in the fullness of time, but the direction towards a game which can not only generate landscapes to survive in but the possibility of stories of survival too does appeal. King Under the Mountain is currently in Kickstarter, with an estimate of April 2018 for an alpha build if successful and late in 2019 for a complete game.